The DHS Show Choirs are traveling to Branson Missouri from April 7th through the 10th to compete in FAME Branson, one of Fame’s national competitions held at the Branson Event Center. Cost per student is approximately $600 for this trip. We have 6 students who have been working hard but have fallen short of raising the necessary funds to attend. If anyone would like to donate towards these students trips, please contact Shelley at sjohnson@dekalbcentral.net or me at kentdjohnson76@gmail.com. Any amount from $25 on up will help these students and would be greatly appreciated. One special part of this trip will be going to the Hughes Brothers Theater to see Forever Young- a show written, directed and produced by Josh and Justin Sassanella. Students will see alumni from the DeKalb Show Choirs program perform and meet with them afterward to discuss what it’s like to make a living as an entertainer. DeKalb Dynamix competed in the first ISSMA State Vocal Jazz competition. While no placements were given, the Honor Choir named was Whiteland. DeKalb’s Caroline Harlow and Holly Woollweever both captured honors of best female soloists of all choirs. Sound Sensation was named State Runner up with Best Visuals at the ISSMA State Show Choir Championship. Northridge was Grand Champion with Best Vocals. 3rd was Plainfield, 4 New Prairie, 5 Fairfield, 6 New Palistine, 7 Columbia City, 8 Bedford North Lawrence & 9 Southmont. Classic Connection was 5th with Best Visuals. 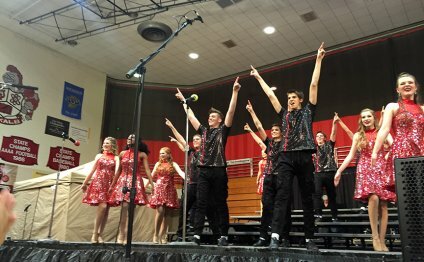 Grand Champion was Fairfield with Best Vocals, 2nd Churubusco, 3 Plainfield, 4 Northridge, 5 DeKalb, 6 Columbia City, 7 Bedford North Lawrence, 8 Garrett, 9 Pendleton Heights, 10 New Prairie. One vocal judge had DeKalb 49 points below the other vocal judge. Both Visual judges had DeKalb in 1st place. DeKalb Show Choirs travel to Branson to compete in the Fame competition there in April. In the unisex division, Zionsville was Grand Champions, DeKalb Sound Sensation 2nd, DeKalb Skinny Bois 3rd and Mooresville 4th. Best performer for Sound Sensation was Holly Woollweever, Best Performer for Skinny Bois was Andrew Hartman. In the mixed division, Zionsville was Grand Champion, Homewood Alabama 2nd, DeKalb Classic Connection 3rd, Zionsville Women 4th, Manteno Illinois 5th. Best performer for Classic Connection was Caroline Harlow. This Saturday is the State Show Choir finals; as well, Friday night is the first State Vocal Jazz Finals. DeKalb’s Dynamix will be competing for the State Championship. The Vocal Jazz Finals are not classed, so all schools regardless of size will be competing with each other. The Skinny Bois and the Dynamix both were awarded Gold ratings at ISSMA District competition on Saturday at Concordia HS in Ft Wayne. Dynamix was qualify for the first State ISSMA Vocal Jazz contest to be held on the Friday night before State Show Choir finals. The list of 8 competing at State will be announced this Friday. Classic Connection, Sound Sensation and Skinny Bois will all compete at Jefferson High School in Lafayette IN this Saturday. This is the last ISSMA State qualifying competition and the top 9 school in the women’s and mixed division to Compete for State Championship will be announced this Sunday.